I'll never look at a sauna the same way again. On The Mysteries of Laura Season 2 Episode 6, there was a lot of focus put on the relationship between Meredith and Billy, but it was a refreshing change of pace. I've always enjoyed the dynamics between the two of them and have been interested to see how their relationship evolves. Of course there was still plenty of emphasis put on the potential relationship between Jake and Laura, but we'll get to all of that shortly. Let's start things off and discuss, "The Mystery of the Dead Heat." I realize Laura may be constantly telling Jake she's still with Tony, but she's not helping matters by agreeing to go out to dinner with Jake. Laura knows Jake wants to be more than friends and a simple solution for her would be, if Jake does want to go out as friends, is to bring Tony along and maybe a few of their team members. On the other hand, I do understand why Laura would agree to go out with Jake as friends – this is the father of her children. Laura is always going to care about Jake, whether they get back together or not, and it's being made crystal clear she'll do whatever it takes to help Jake get better. Jake was only going to agree to a second opinion if Laura agreed to go to dinner with him and Laura knew this. Speaking of Jake's heart issues, why would he not want to go in for a second opinion? I don't care if he's scared by what the results may be – he has to do what is best for his heath and think about his children. If he can't stay on top of his heath for himself, the least he could do is do it for his kids because they need their father around. Switching gears to another couple, I am thrilled Billy and Meredith's relationship is being discussed more. It almost seemed like they dropped the story on The Mysteries of Laura Season 2 Episode 1, but I was pleased to see them going ahead with Billy and Meredith as a couple; though I am surprised both Billy and Meredith would not realize the people they work with would figure it out. They are detectives for goodness sakes – it would take them all of an hour to figure out there was something going on between the two of them. Billy also doesn't need to take Jake's advice regarding Meredith meeting Billy's mother – everyone remembers Jake doesn't have the best track record with women, right? Moving on to the case of the week, I appreciated the little twist of it not being about the murder, but having the people responsible for said murder actually orchestrating a very sophisticated break in of the NYPD property vault. It was something I wasn't expecting and made the case way more interesting. It was also nice to see Laura back up Captain Santiani and give her credit for the case. Captain Santiani certainly hasn't made the most friends, and I know fans of the show aren't loving her, but I am slowly warming up to her character. So far all that's really known about her is she's tough and has something to prove. She's not a well rounded character yet, but I hope it changes soon. In the end, Meredith gave Billy a hard time about his mother coming to town. I'm fully on Billy's side and think it's time for them to move to the next level and meet the parents. By the way, Billy's mother is absolutely adorable, and I chuckled at the back and forth between her and Billy. Don't feel bad if you missed out! You can watch The Mysteries of Laura online now via TV Fanatic anytime. Just make sure to come back to let us know what you think. 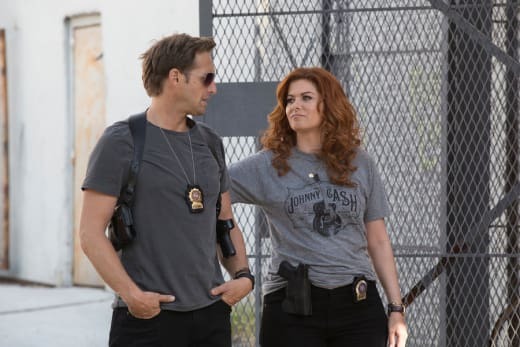 On The Mysteries of Laura Season 2 Episode 7, Laura and the team investigate a smuggling ring, but are surprised to find out what is being trafficked. Will they be able to put a stop to it? Find out Wednesday, November 4 at 8/7c on NBC.